Memorial Day weekend is the unofficial start of summer and the beginning of BBQ season. I think most people would agree that a BBQ is nothing without a plump, juicy burger. But what makes one burger better than the other? Burger enthusiasts would say it's the bun. The bun can make or break a good burger if they aren't the right texture. So what is the right texture? Burger buns need to be sturdy enough to hold the meat patty & it's fixing yet still light and soft, as not to overpower the meat. This summer if you want to set your burger apart from the rest I suggest making homemade burger buns. In the bowl of a mixer fitted with a paddle, stir together yeast, milk, and 1 1⁄2 tsp. sugar; let foam about 5 minutes. Stir in remaining sugar, flour, salt, and egg. Mix on low speed until dough forms. Replace paddle with dough hook; add butter and knead on medium-high speed until dough pulls away from sides of bowl, about 8 minutes. Transfer dough to an oiled bowl; cover with plastic wrap. Let rest in a warm place until doubled in size, about 2 hours. Divide dough into 12 portions and shape into a tight balls. Place balls on a parchment paper-lined baking sheet. Lightly brush with oil and cover loosely with plastic wrap. Let rise for 1 1⁄2 hours. When ready to bake, heat oven to 400°. Brush buns lightly with water and sprinkle each ball with sesame seeds. Bake, rotating once, until golden brown, 20 minutes. Let cool. Yep...got to have a good bun. These sound perfect! These look like the best buns in the world!. I have never made homemade burger buns! And in fact, I've never even thought to do it - but you've totally inspired me, because I'll bet they are a million times better than homemade! Oh, fantastic! 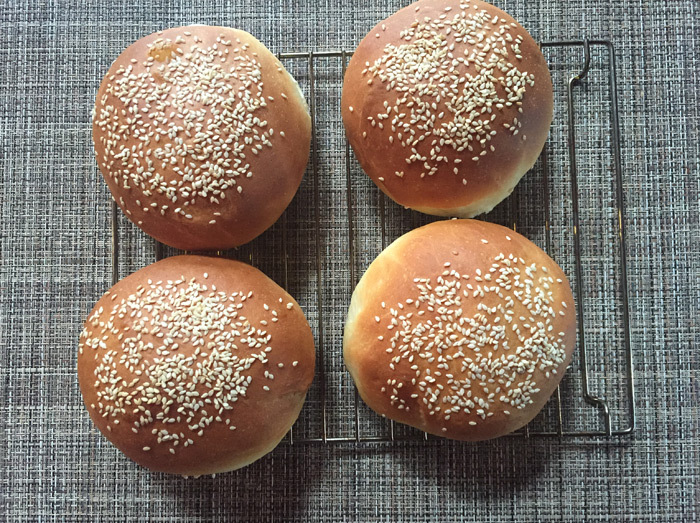 Nothing like homemade bread and your sesame buns rock! Oh love homemade burger buns! And you're right, every BBQ needs hamburgers!! These look so good! I have never made homemade buns before! Oh wow, these buns look perfect!! Total yum! These are picture perfect. I have a fear of yeast...there I said it! These buns look so perfect that I think I have to put them on my summer bucket list!